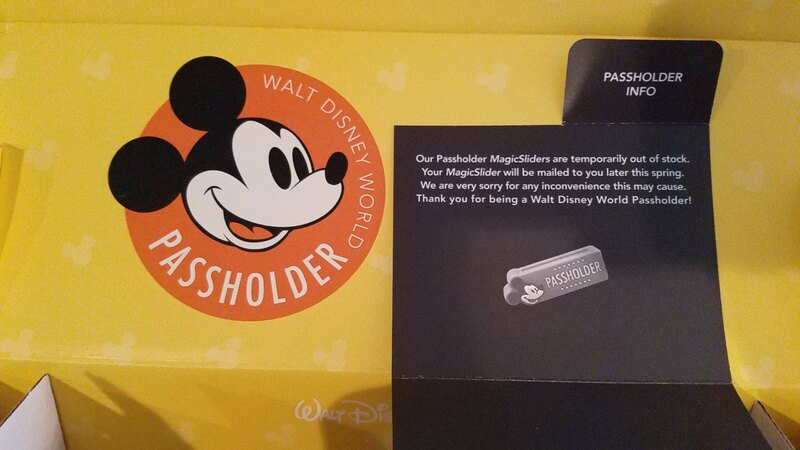 One of my readers, Blair, messaged me today to tell me that when his Annual Passholder renewal MagicBands arrived today, the usual AP MagicSliders were not included. Instead, he was given a little note stating that the slider was out of stock and they wouldn’t ship any to him until later this Spring 2017. I’ve never heard of this happening before, and I’m curious as to why they couldn’t make enough of these. Are they changing the design? Was there a manufacturing issue? 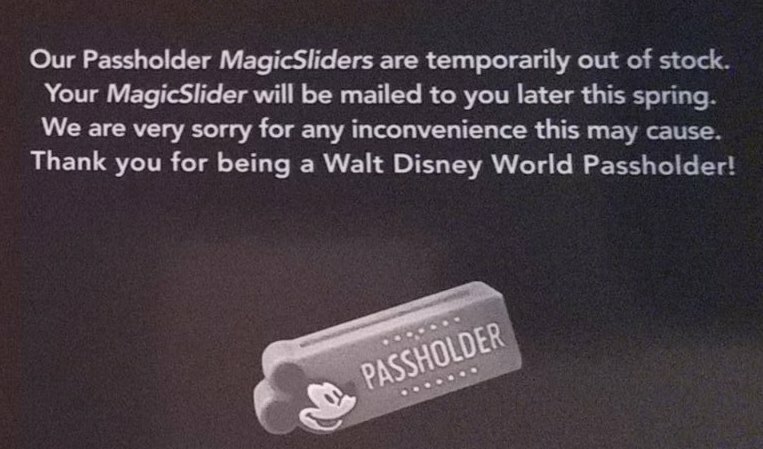 Maybe a slight change to the sliders so they better fit MagicBand 2? Just beware if you are ordering your AP MagicBands any time soon that you may not get them in your box! 17 Responses to "Annual Passholder MagicSliders are out of stock; Shipment delayed until Spring"
My AP band came a few weeks ago, short a slider. I tend to think they are both mid design change and out of the current styles. That’s the only way it makes sense to have months lead time on such a simple item. I seriously hope they are going back to the old way of having a different one every year. Sorry Nadia, I haven’t heard nothing about that changeover just yet. Hopefully soon! The MagicBand sliders fit perfectly onto the MagicBand 2, so its probably a new design. Any news on these. It’s been a while. We tried calling Disney and were tossed around to a few different departments that really couldn’t give me a straight answer. What’s kind of frustrating is my friend just ordered hers in May and the band came with a slider. I called today and they asked me if I had called to request the sliders. You might want to call the park ticket office and ask them. They also said they may have them at Guest Relations at the parks. She was not sure though. She took my information and submitted a request for me to have them shipped to us. Just a bit of a clue as to what is going on. I just renewed my AP 2 weeks ago and received my band last week with an orange slider. Same as the one I received last year. I really don’t know if there is a number to call. I haven’t heard how people are supposed to get them. Well, this (only way I could get them was to go get them at Guest Relations at any park in person) is distressing. I renewed my pass in April but also received “the note.” I had to visit GS at the end of August to have my plastic card updated. It never occurred me to ask about the slider. The note did say that they would mail it when available. My son renewed his in April but didn’t order his MB until early August. He received the slider. October 9th and I still haven’t received my slider. My Magic Bands came in MARCH! So annoying. I called and was told to go to guest relations on my next visit. I’ll be super bummed if they’re still out. My husband and I bought an annual pass In January and we never received them. I have asked at guest relations several times last time being the end of September and they didn’t have any . I was told they would ship in April 2017.